As the prime consultant, AmerCom Corporation provided Construction Inspection Services for the New Jersey Department of Transportation on this interim repairs project. Opened to traffic in 1941, the existing “Lincoln Highway” Passaic River Bridge has been carrying over 77,000 vehicles per day that includes a majority of heavy truck traffic through four heavily congested lanes over the navigable portion of the Passaic River between the Ironbound section of Newark to Kearny Point in Kearny, NJ. This project was under AmerCom’s Region North, 3 Year CE&I Term Agreement, 2007BCE636A. The project consisted of the interim repairs of the nearly 2,005 foot long eighteen span bridge that includes a vertical lift main span. Construction Inspection on this $15.3 million movable bridge involved replacement of the grid deck installed on the previous Contract, structural steel repairs, and movable bridge control systems including mechanical and electrical repairs. AmerCom’s responsibilities included: being the Department’s direct representative, providing appropriate construction inspection/engineering personnel, overseeing the quality of work provided by the Department’s construction engineering/inspection staff. This project required extensive maintenance and protection of traffic coordination as well as communications with the U.S. Coast Guard. Coordination with the USCG was critical due to marine traffic since it takes the existing span about 15 minutes to be raised. 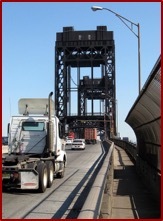 Since the Pulaski Skyway prohibits trucks, this designated main trucking route is one of the eleven key components of NJDOT’s Portway International Intermodal Corridor projects linking the Newark-Elizabeth Air/Seaport Complex, intermodal rail facilities, trucking and warehousing/transfer facilities with the regional surface transportation system that extends through the Holland Tunnel and into New York City. • Timely reviews of all contractor submittals including shop drawings, Primavera schedules, etc. • On-site inspection of contractor’s construction means and methods. • Accurate, complete and concise field inspection records and measurements. • Clear, concise, immediate and documented communication of all construction issues and concerns. • Thorough and timely reviews of payment requests.